Stephen Gee, writer of “Los Angeles Central Library, A History of its Art and Architecture,” will present a short illustrated talk about the book and the library Mon., Aug. 22 at 7 p.m. at Chevalier’s Books at 126 N. Larchmont Blvd. Mr. Gee will stay to sign books. For further information, call Chevalier’s at 323-465-1334. CENTRAL LIBRARY talk and book signing is at Chevalier’s Aug. 22. The Los Angeles Central Library is one of the most distinguished buildings in the city. It is known for its striking architecture, fine artwork, and noteworthy collections within. However, it was not always so highly cherished, and at one point was in real danger of being torn down. Then-City Librarian, Wyman Jones, and many on his staff were pushing actively to demolish and replace the building. 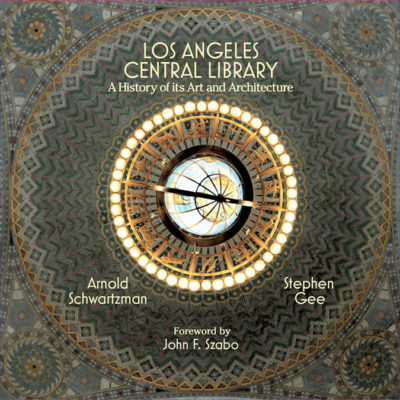 Now, 35 years after a preservation movement that prevented the building’s demolition, the story of the Central Library has been chronicled through the publishing of “Los Angeles Central Library, A History of its Art and Architecture.” Written by Stephen Gee and photographed by Arnold Schwartzman, this book is a captivating display of the building itself, the beautiful artwork inside, and the story behind some of the “civic involvement” that impacted the library. Each of the 240-page book’s 12 chapters paints a picture of the library and reminds Angelenos once again why this building is so essential to the culture of the city. Of particular interest locally, and as mentioned briefly in the book, the circa 1980s saving of Central Library was deeply influenced by the actions of a local Windsor Square resident and a Miracle Mile architect. John H. Welborne, now the publisher of the Larchmont Chronicle and then a young lawyer, together with Miracle Mile architect Barton Phelps, FAIA, stood up to protest the demolition. Welborne formed the Citizens’ Task Force for Central Library Development, and Phelps became one of the group’s core members. The book recounts how Phelps gave a speech to the Central City Association that convinced its leaders to join the opposition to the library’s destruction. Author Gee explains that Welborne, Phelps and their allies ultimately were successful in their efforts and were among the key players responsible for the beautiful building still standing today. In an interview with author Gee, he commented on how the Central Library is a connection between generations. Many Los Angeles citizens have had “transformative experiences” within this library, which brings these generations together by sharing a common ground for those experiences, he explained. Today, the idea of tearing down such a significant building in Los Angeles seems almost unimaginable. Yet, that was not the case in the 1970s and right before and after. This book details the real threat of demolition and cites how two local men’s passion for the building helped stop that horrific occurrence from happening. “None of the buildings in Los Angeles says more about who we are as a society and what we care about than the Central Library,” says Gee. His book captures the building’s cultural significance and beauty. It is available at Chevalier’s Books in Larchmont Village.